It is time to get those students who will be entering Kindergarten at McKinley for the 2019-20 school year registered. If you have a child whose Birthday is between September 2, 2013 and September 1, 2014 then they are eligible to attend Kindergarten in the fall of this year. We have rescheduled our Kindergarten Getting To Know You Activity for incoming Kindergarten students and their parents on Wednesday, April 17th at 2:15 PM here at the school. Please bring birth certificate and immunization record for us to copy and if you have the Health History Form filled out, bring that as well. If you don't have that filled out, we will have you fill one out that day and leave it with us. *If you have had other students at McKinley or in Box Elder School District and have an Aspire account then you will need to click on the green button that says "Login and register" under "I already have an Aspire account" under New Student Registration. 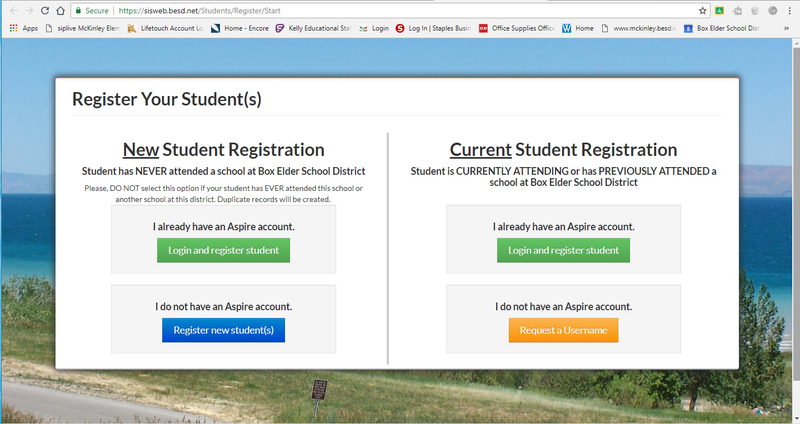 *If this is your first student in Box Elder School District or you have other students but have never set up an Aspire account before, you will push on the blue button "Register new student(s)" under "I do not have an Aspire account" under New Student Registration. *If your student has been at the Early Learning Center then they already are in our system but if you have never set up an Aspire account then you will need to click on the yellow button that says "Request a Username" under "I do not have an Aspire account" under Current Student Registration. *If your student has been at the Early Learning Center and you already have set up an Aspire account then you will need to click on the green button that says "Login and register" under "I already have an Aspire account" under Current Student Registration. PLEASE NOTE THAT IF YOU HAVE A STUDENT AT THE ELC AND IT SAYS YOU CANNOT REGISTER AT THIS TIME, CALL THE SCHOOL AND GIVE US YOUR INFO SO WE CAN MAKE SURE YOUR STUDENT IS ON THE LIST AND THEN YOU MIGHT HAVE TO WAIT UNTIL THIS SCHOOL YEAR IS OVER BEFORE YOU CAN GET THE ONLINE REGISTRATION DONE. Make sure to note that the Health History Form is something that you can fill out online and print to bring to the school. We will also need a copy of the child's birth certificate and immunization record before they can begin school. 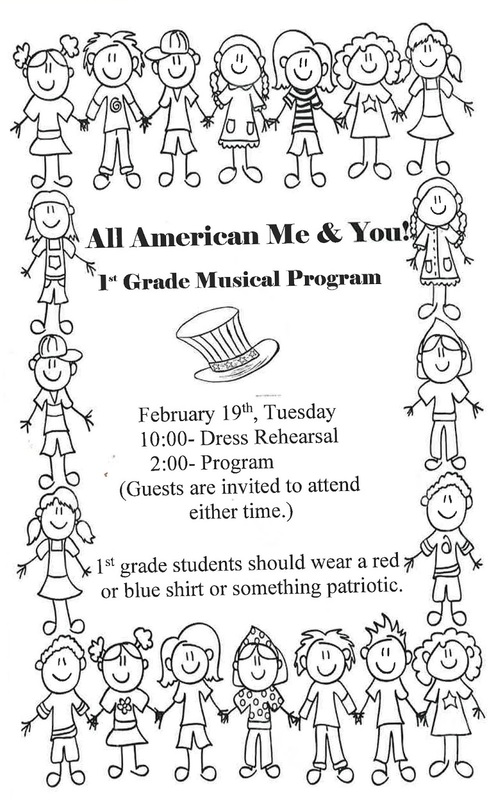 Please click HERE to register your Kindergartener. We look forward to having your student at McKinley. You can call the the school with any questions. You can only order Yearbooks online this year. If you would like to order a yearbook, please go online to ybpay.lifetouch.com and enter code 11997319. THANKS! The deadline is March 29th. The Child Nutrition Department at Box Elder School District would like to remind families that they can apply for free or reduced meals at any time during the school year. Currently there are many households in our district that have a family member who has been furloughed due to the government shutdown. We recommend applying or re-applying anytime that your household experiences a reduction in income. The guidance that we have been given in regards to this situation is that families that are affected by the shutdown may apply for benefits claiming their current reduced income (during furlough). Families may qualify for free or reduced meals, the determination will be based on income eligibility guidelines established for SY 18-19. Because we need to maintain the integrity of the application process we urge families who are approved for free or reduced-price meals based on their reduced income during a furlough period to terminate their free/reduced price status should the economic hardship they experienced or had anticipated due to the furlough be remedied by a return to work and/or restoration of pay for the furlough period. Families that qualify for benefits due to their reduction in income during the furlough will not be responsible to pay back the benefits they received for any of the meals received during the furlough once they terminate benefits due to restoration of pay. Families can apply online or a paper application can be filled out at your child’s school or the District Office. To apply online go to http://www.besd.net at the bottom of the page click on “lunch balances” log in to account or create one if needed. Click on the icon titled free/reduced meal application. Follow instructions to fill out. You will be notified by mail of application results. 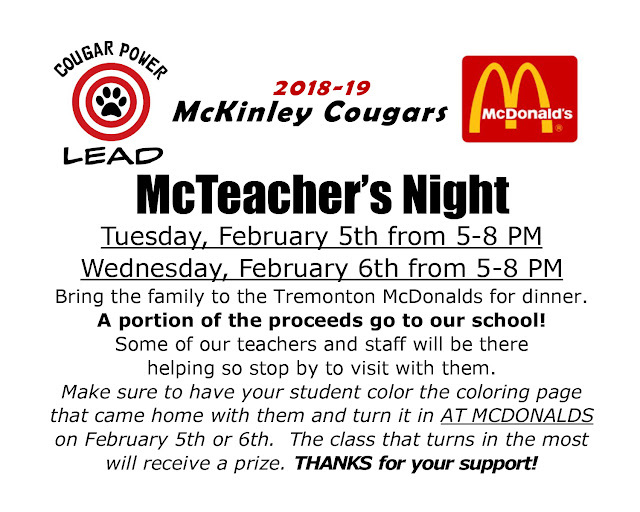 Please contact the Child Nutrition Department amy.woolsey@besd.net or 435.538.1154 with any questions or help needed. Click HERE to open and print the paper form of the free and reduced lunch application. Those who turned in a Toys for Tots Application, the items will be available to pick up from the office on Friday, December 21st. You will need to pick them up between 8 AM and 12:30 PM. The school will not be open after that time until after the Holiday break so PLEASE MAKE SURE TO PICK UP THE TOYS FOR TOTS ITEMS DURING THAT TIME FRAME ON FRIDAY. If you have any problems or questions, please contact the school.